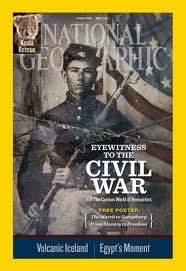 The May issue of National Geographic features a piece on Civil War reenactors. To which I can only say, ..."Huh?" I can't figure out how grown men playing dress-up and pretending to shoot each other is a way of honoring the dead. Now don't get me wrong, I am very proud of the veterans in my family. I'm all for parades and planting flags on soldiers' graves, but what I'm really for is not shooting people to begin with. So this Memorial Day, as I enjoyed a BBQ, I also hoped for peace and the safe return of brave Americans serving in Afghanistan.